Are you starting to feel like you can’t bear to see another pumpkin? One of the things I love about living in the northeast is the change of seasons. Not that I’m a huge fan of snow (that’s an understatement – I hate snow!) 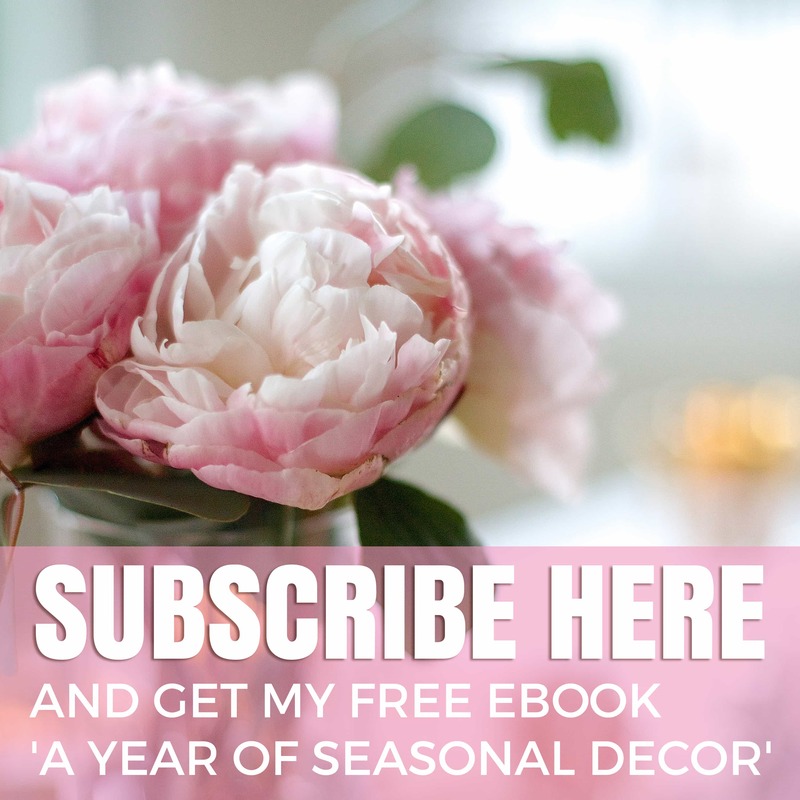 and I truly love fall decor, but the time has come to move away from the earthy imagery of autumn and into the glimmer of the holiday season. 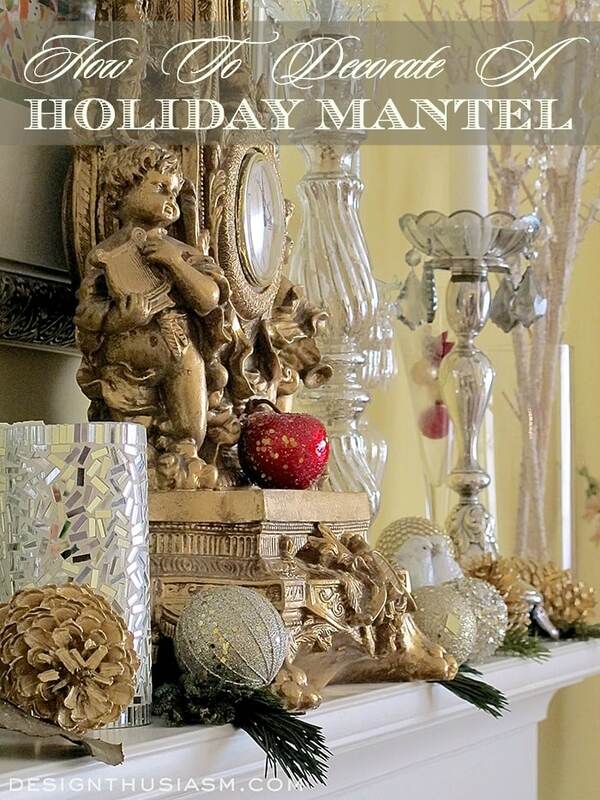 It’s the perfect time to begin to think about how to decorate a holiday mantel. I love to set an enjoyable conversation spot near the fireplace. 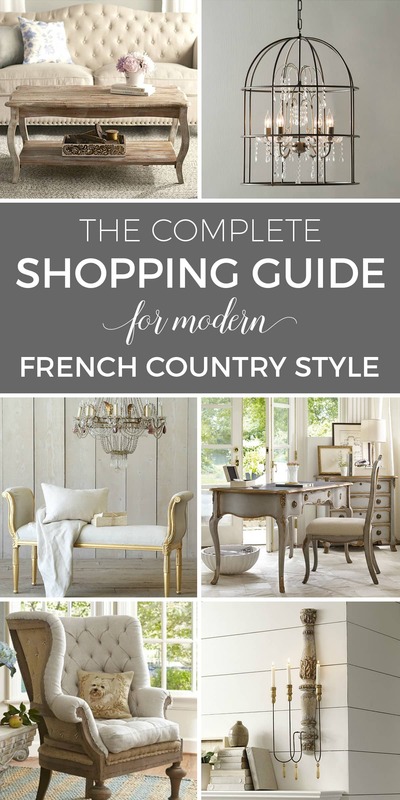 I keep these French chairs nearby all year long, but I change the pillows often for seasonal color. I’ve also added this delicate little table to make it easy to have a toast by the fire. On the mantel itself, I layer in the glimmer. 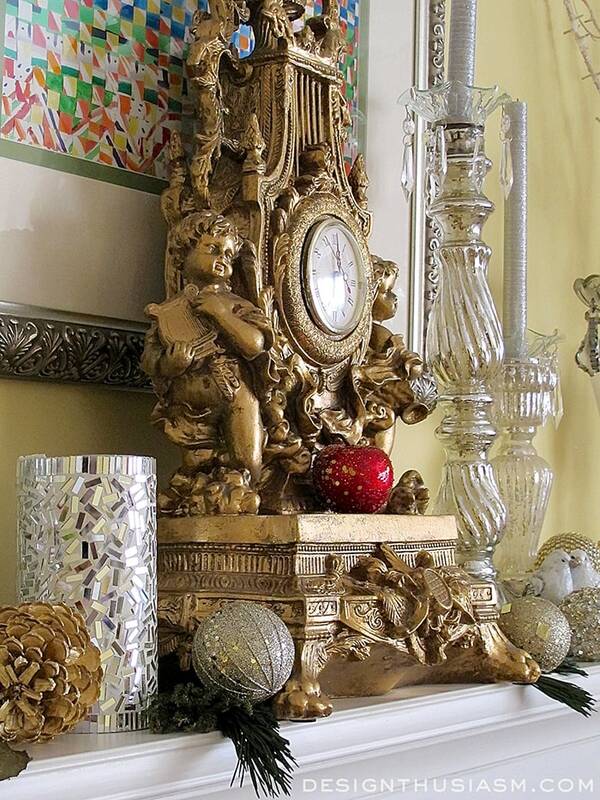 My gilded mantel clock is the consistent centerpiece, but the holiday cues emanate from there. I mix silver and gold liberally, with lots of white for a wintery feel. These candles have an almost mosaic look with mirrored bits embedded in the surface. The quickest way to signal a holiday message is with shimmery balls and colorful ornaments tucked amidst your mantel display. These glitter dusted pine cones are carry-overs from fall and the nice red cabernet is perfect for the colder season. I always have candlesticks scattered throughout my home, so I moved the mercury glass ones to prominence on the mantel. I love their varying heights, while the silvery tones unify them. 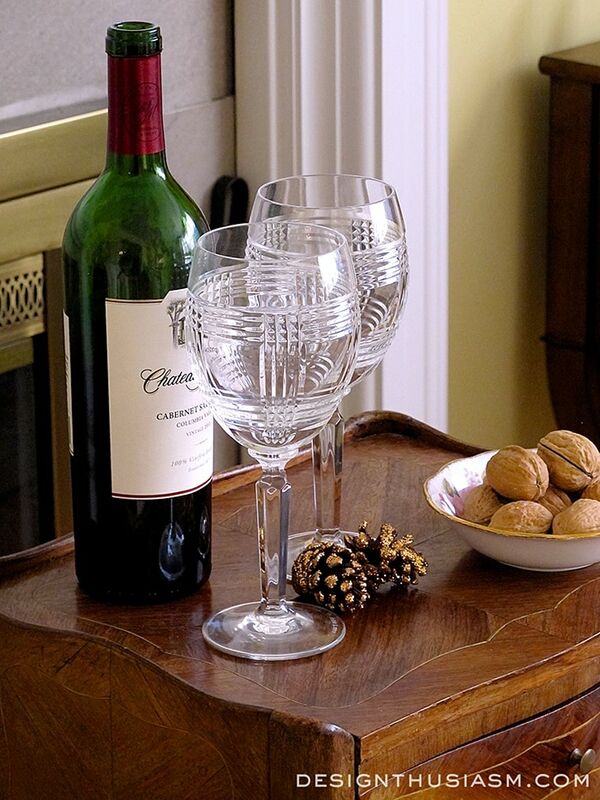 The floral pillows are from Ralph Lauren Home, as are the glen plaid wine goblets. The table was found at an antique shop and the chairs were passed on to me from by grandmother, with their original cream damask in tact. I think my favorite part of this wintery scene is the snowy white birds resting in their nest. I use tiny touches of greenery here and there to ground the whole mantelscape. At the outer flanks I placed winter white branches, bare for the season and sprinkled with faux snow. 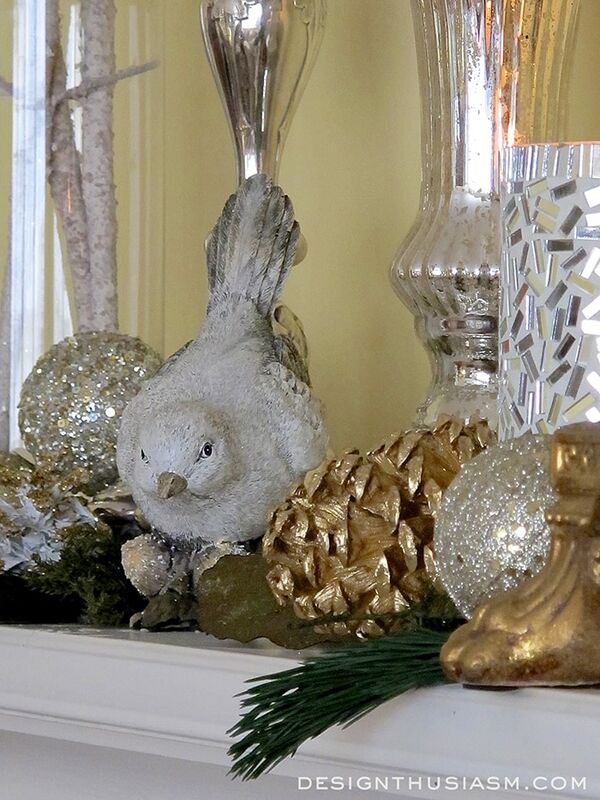 Another white bird shares the ledge with gilded pine cones and repeated holiday motifs. 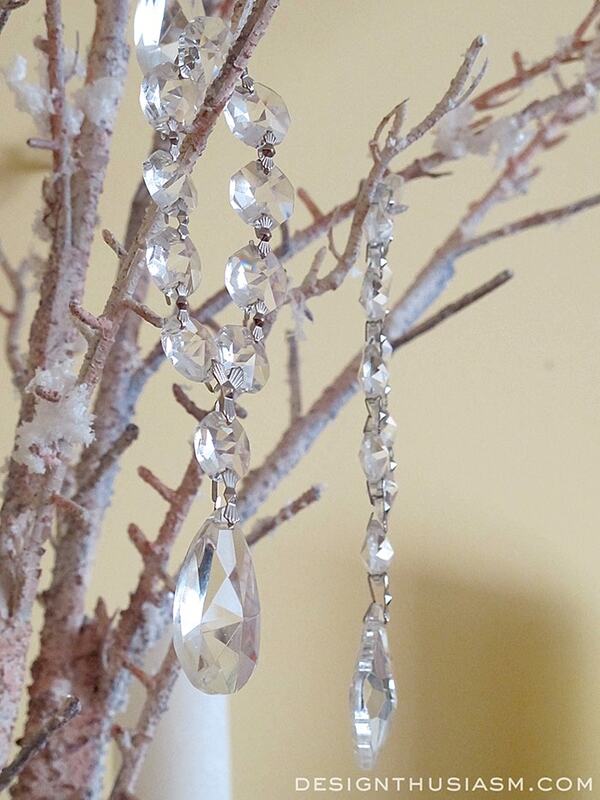 On the branches I’ve draped these crystal drops, which are actually napkin rings used as ornaments. 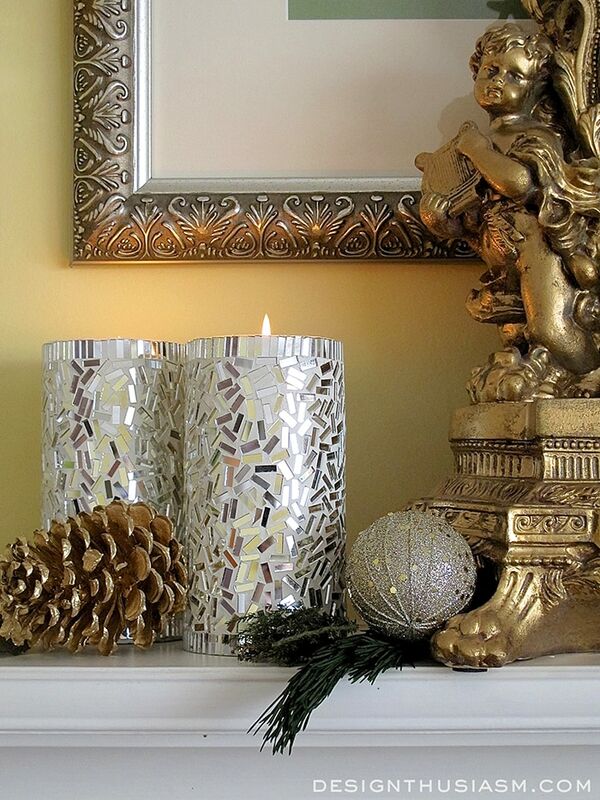 The gilding, mercury glass and glitter combine to create a truly sparkling holiday mood. 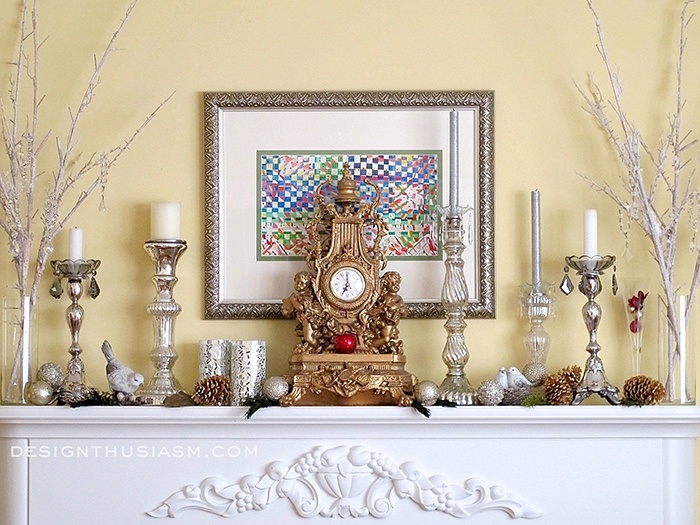 The weather may have turned cold outside, but a holiday mantel spreads warmth and cheer! 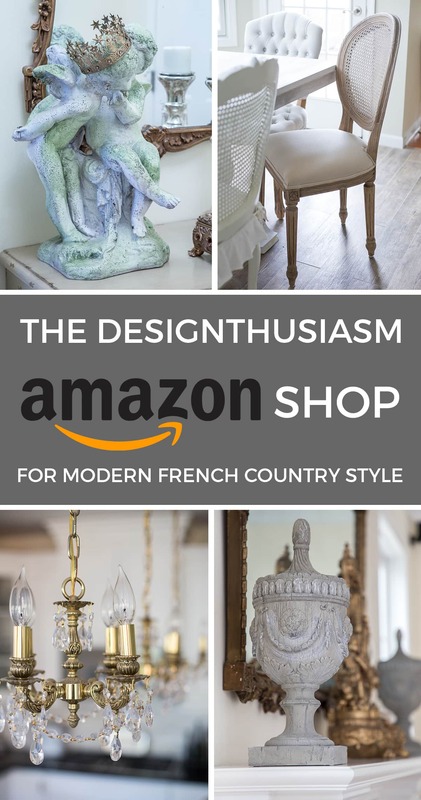 Your mantel is so elegant and lovely, I am sure you will enjoy it dressed like this throughout the holidays! Stay warm! Thanks so much Chloe! Ugh, not so easy to stay warm. I hate the cold! But it is a fun season… 🙂 Enjoy!! 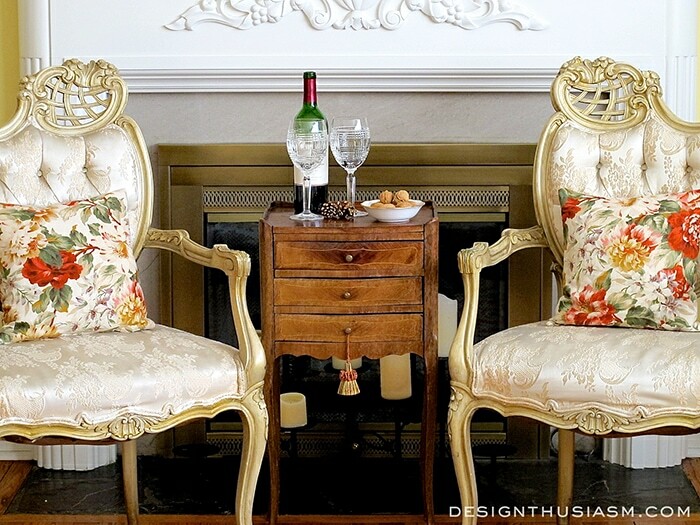 Your grandmother’s chairs are just the coolest! The mantel is absolutely stunning. Aw, thanks so much! She would have been chuffed to know people would be appreciating them… 🙂 Thanks for stopping by!! 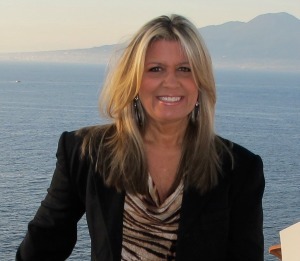 Lory ~ Your mantel clock is truly beautiful! I am green with envy : ) It all looks so pretty with the different tones. Very pretty! I am going to pin your photos! 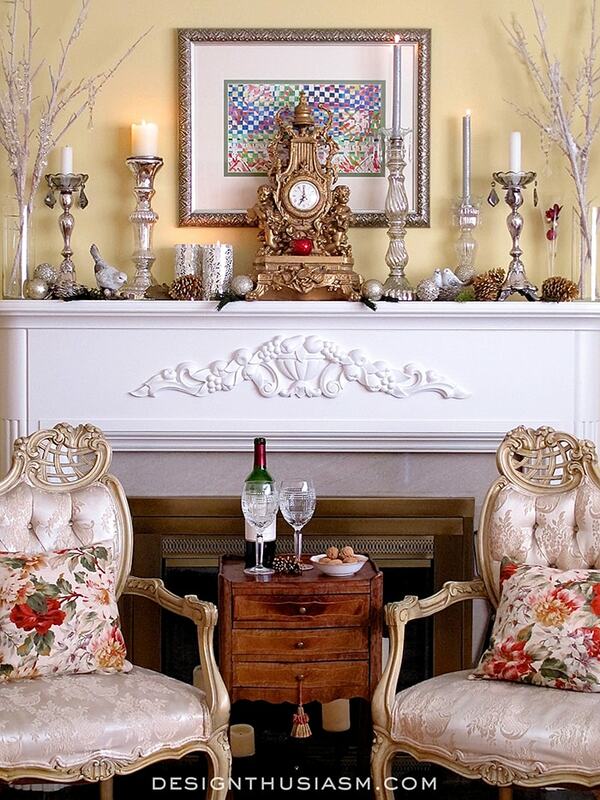 Elegant is the word that comes to mind when I look at your mantle which is a perfect fit for it surroundings. You make me have mantle Envy as mine is a bit too narrow for much decorating. Truly stunning. 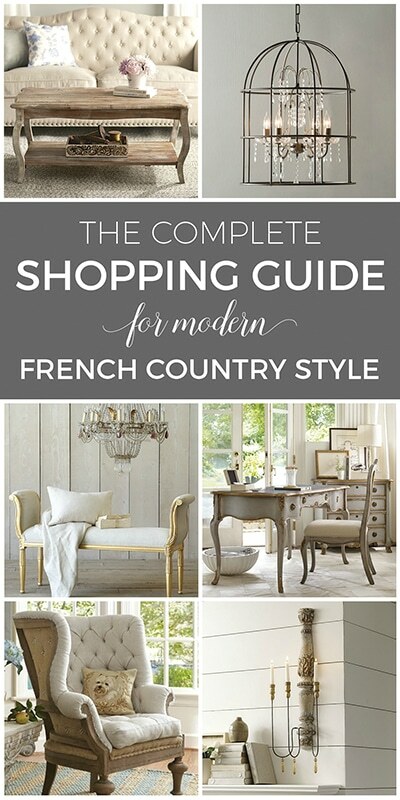 Everything is just gorgeous and very elegant without being over the top. That vintage clock is amazing. Thanks Janet! I wish I could remember where I got it, because I do like to add that info. It’s actually not that old and while it was gold when I got it, I painted it a brighter gold, leaving some of the darker bits showing. Thanks for stopping by! Hi, Lory! The clock is a great jumping off piece year round. 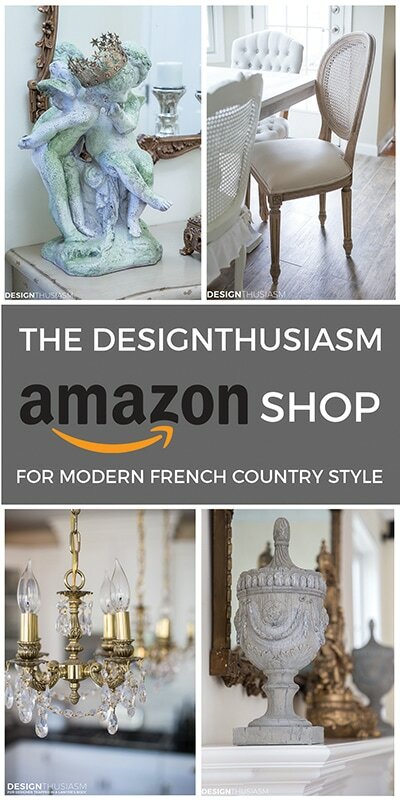 That was an excellent choice so that you don’t have to keep reinventing the wheel every time you embellish the mantel. 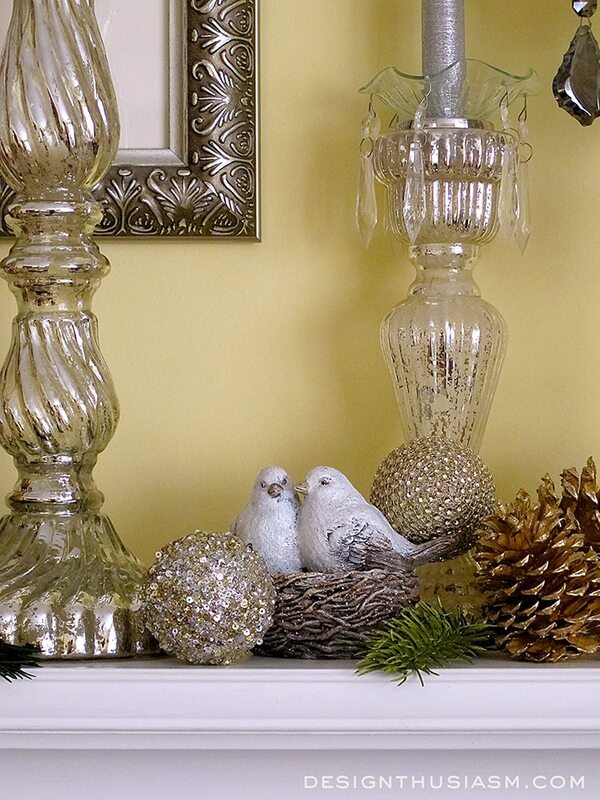 I love the terrific mix of items you included in your mantel decor. There’s no shortage of texture and height differences here! The teensy bit of red added to it…perfect! 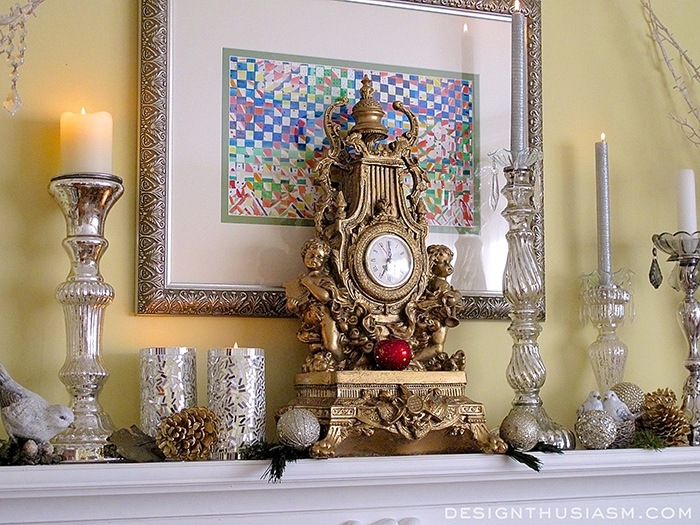 Part of the beauty of a white mantel and fireplace surround is that gleaming metals really stand out. You’ve showcased them beautifully!!! Thanks Alycia! Yeah, it’s funny that I let that tiny bit of red in. Hadn’t planned to. It was going to be all white but some times I start with one concept and then let serendipity take over… 🙂 Thanks for stopping in!! 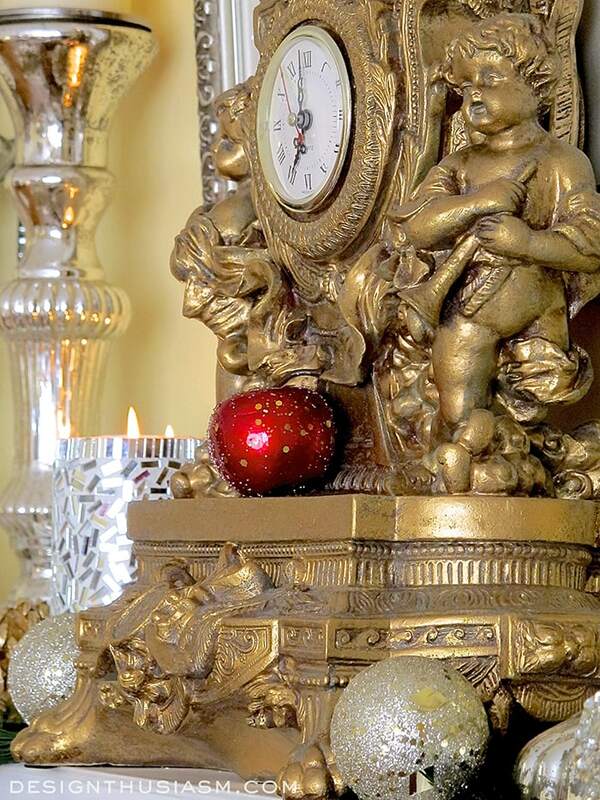 Very classy, I love the little touch of red with the sparkly apple (is it an apple, it looks like it in the photos? Happy Holidays! 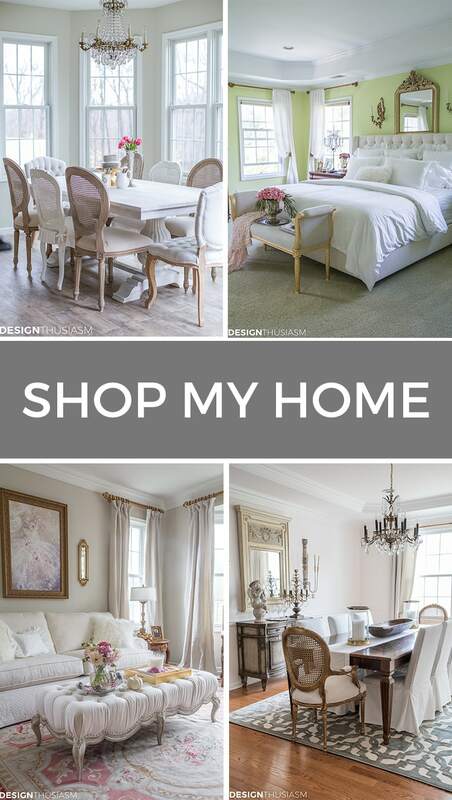 I’m visiting from The Shabby Nest and just had to click on the lovely little vignette of your mantel that you had posted there under Frugal Friday. It’s so beautiful. There are so many wonderful elements to it (not the least of which are the beautiful birds) — the balance and rhythm you created, for one! 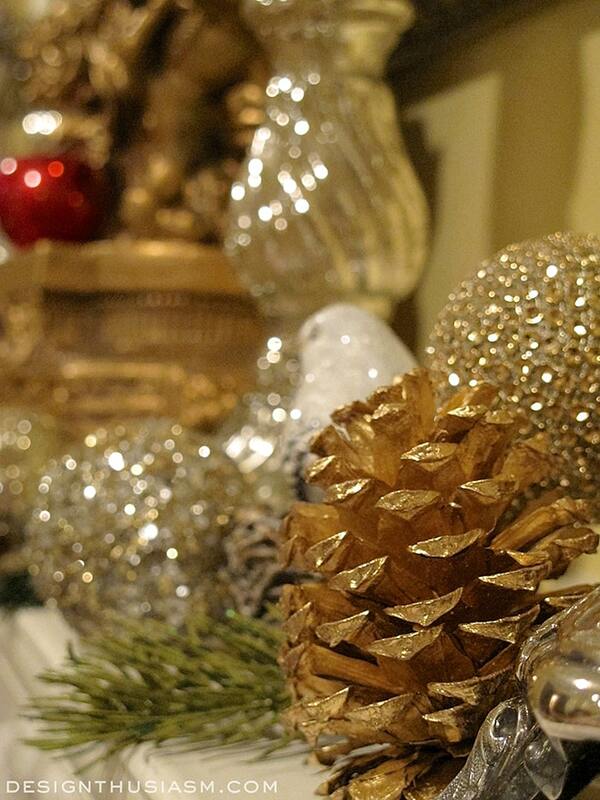 I love mixing silver and gold and all things glittery and crystal and snowy this time of year. I live in southeastern Wisconsin and we’ve had an abnormally cold November — I hope it is not a precursor of the horrid winter we experienced last year, the worst in over 20 years temperature wise. This time of year, when the light is waning on us daily until the shortest day of the year occurs on December 21st, we need all the sparkle and gleam we can get! Once the “Celebration of the Feast of the Sun” passes, the days start to get longer and even though the weather may be bitterly cold, each day brings a few more precious minutes of light! IWhile some may be concentrating on Christmas as the main event, I’m focusing on Winter Solstice! At this time of year, be we Christians or of other faiths, we who live in the northern hemisphere await the return of the warmth and light of the Sun. Until that time returns once again, it is good for us to surround ourselves with beauty and light — candles, fireplaces, Christmas lights, fairy lights, and rich scents (incense and scented candles), soft cuddly sweaters and down-filled throws and comforters, and feast on rich foods that remind us of the bounty of the harvest and the goodness that Mother Nature can shower upon us. 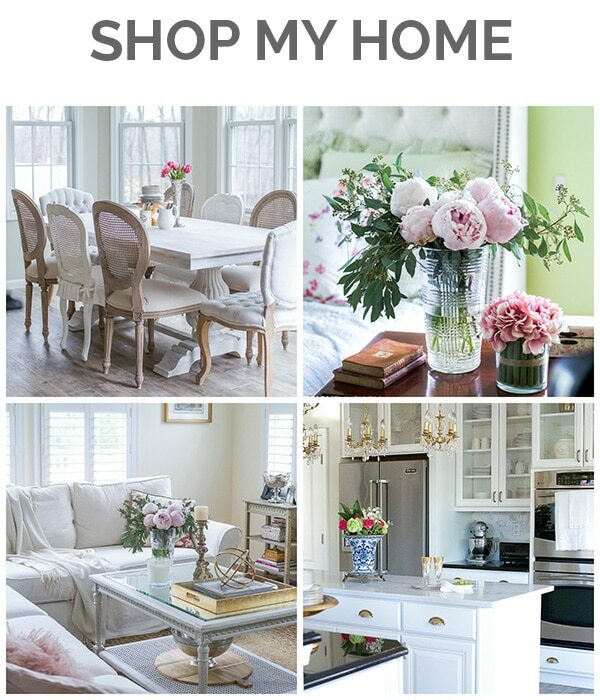 Your decorating reminds me of all of those wonderful things. What a lovely lovely comment, Jan! I can feel the warmth just reading what you wrote… 🙂 Thanks for stopping by and a vary happy holiday season to you too! I wish you warmth and sunlight most of all! !